Generates PDF and multipage TIFF files and/or saves scans as images. Supports TWAIN and WIA scanners, using a proprietary dialog that overcomes the limitations of many WIA scanners. Can scan two pages at once and split the scan in two. 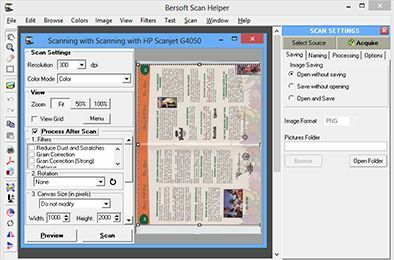 Bersoft Scan Helper can scan books or series of documents for delivery as PDF or multipage TIFF files. Also can save scans as PNG, JPG, BMP or TIF files. Supports TWAIN and WIA scanners. Bersoft Scan Helper provides a far better proprietary dialog than the standard one for WIA Scanners. It remains open between scans, allowing the user to scan any number of pages and also to select the scan area and other options more conveniently than using the standard WIA scan dialog. Also Bersoft Scan Helper can either use its own dialog for TWAIN scanners or use the scanning dialog provide by the scan manufacturer. Scanning two pages at once is easy since BSH rotates and saves each scan as two files, and keeps the numbering right too. When generating PDF or multipage TIFF files, the image files can be arranged, previewed and edited easily before generating the PDF or TIFF file. Blank pages can be inserted in the PDF file and also different layouts can be set for generating PDF\'s with one or more images per page. Footers and/or Headers, including page numbering can be added to the PDF file. Image compression, font embedding and many other options can be set before generating the PDF file or the file can be generated straightaway using the default options. Easy Mosaic helps you to create your own photomosaic with your picture collections. You can do a nice work as a professional designer does, The output quality is best in mosaic market.